Piston Rings Manufacturer, Motorcycle Piston Rings - Japon Traffic Tech Corp.
Taiwan Japon Traffic Tech Co., Ltd. The company was established in 1992 in cooperation with Tai-Chi Traffic Corporation and former Takuang Piston Ring Group (Japan TP Joint Venture Plant) in the technology, imported the precision machinery and technique for professional production (Complete OEM assemblage). The power engine is installed with the excellent piston-ring, which is sold throughout the world. 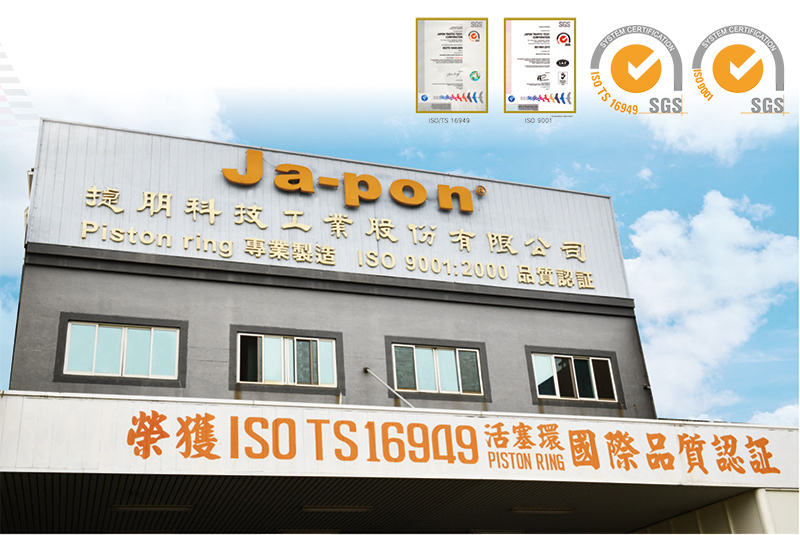 Japon Traffic Tech Corp. is a superior quality Piston Rings Manufacturer in Taiwan, supplying Motorcycle Piston Ring, Inspection Equipment and Machines with superior quality. We supply Nitride Steel Rings, Motorcycle Parts and Coating Test Report. In addition to Piston Rings, we also provide Multiaxial Driller, Oil-Ring Rail Rings and Engine Piston Rings. If you are searching for high quality Ovality Shaping, Surface Roughness Tester and Engine-Cylinder Sets, please do not hesitate to contact us.